Advances made during the MRI Year 1 development and field season contributed greatly to successful large deployments in Greenland and Antarctica, under projects such as POLENET. Approximately 45 GPS and 25 seismic remote permanent stations were installed, including five GPS "science kits" provided under MRI funding to several PI's for installation at diverse Antarctic locations. During the Year 2 MRI season, all technical goals were again realized thanks to intense efforts by the field team and assistance from the U.S. Antarctic Program logistics providers and support staff. Five new testbed or prototype systems were deployed in Antarctica and four existing prototype stations were upgraded, each serving a specific function in developing technologies or optimizing deployment. A cold-hardened GPS testbed was installed near South Pole station, representing UNAVCO's initial design for Plateau operation (Figure 2). 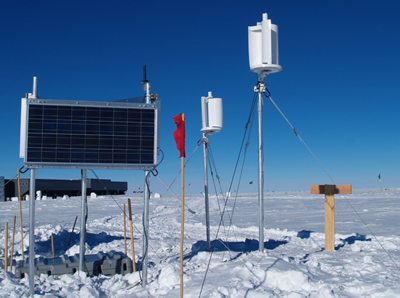 An advanced seismic system designed for two-year continuous operation on the Plateau was deployed at the SPRESSO site near South Pole, and an existing seismic prototype at South Pole was retrofitted. A seismic system designed for operation on the continental margin was deployed at Minna Bluff, and maintenance was performed on the nearby existing GPS prototype. A GPS prototype, equipped with better insulation and active thermal management, was installed at the Miller Range. A combination GPS/seismic testbed was installed near McMurdo Station which demonstrates integrated structural, power, and communications systems (Figure 1). Existing GPS and seismic testbeds near McMurdo were also upgraded, including a test of a lead-acid and lithium-ion battery combination to power a GPS receiver. Figure 1 - GPS/seismic test site at McMurdo Station. Both systems share a single frame, and power and communications are integrated. 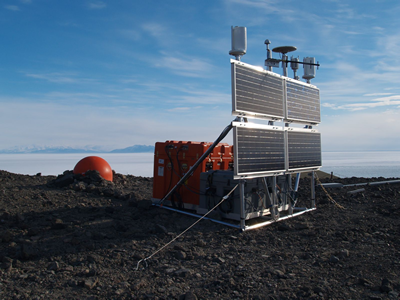 Figure 2 - GPS Plateau Testbed site installed at South Pole Station. This is UNAVCO's first cold-hardened design for operation on the Polar Plateau.